Some businesses need to store lots of data in as small a space as possible. Enter the next generation in optical storage from Sony and Panasonic: 300GB optical discs starting next year. The 300GB discs will be the smallest of the new entries in optical storage. They will be followed by a 500GB version and ultimately a disc that holds a whopping 1TB. For comparison, current Blu-ray discs commonly hold 25GB, and the highest-capacity Blu-ray we’ve found for sale tops out at 100GB. Dubbed Archival Discs, these plastic wonders will reportedly be readable for a minimum of 50 years. On top of that, a Panasonic rep claims that the new discs don’t require special storage environments or specific temperatures to keep in tip top shape. 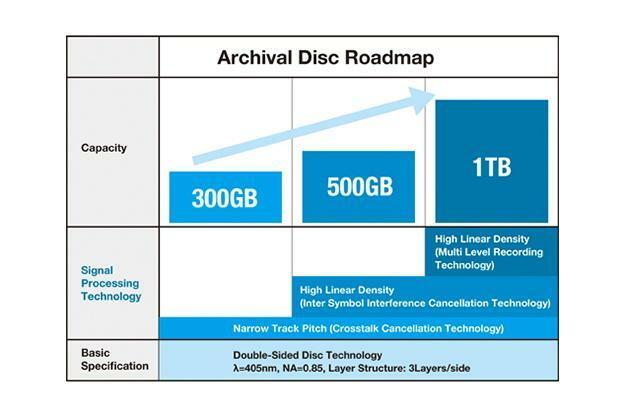 Though you may already be dreaming of the entertainment applications that 300GB, 500GB, and 1TB discs potentially hold, reports state that Panasonic and Sony are aiming these discs for big data storage applications like cloud services, not consumer use. If the 50-year readability claim has merit, these discs sit much higher on the durability totem pole than other storage formats. For instance, a study conducted by BackBlaze, an online backup services firm, found that of the 13,000 Seagate hard drives it tested, 1.5TB drives had an annual failure rate of 14 percent, while 3TB and 4TB drives suffered annual failure rates of 9 percent, and 3 percent, respectively. It’s currently unclear how much any of these discs will cost once they hit the market next year, but we’re pretty sure that they won’t come cheap.